A bulbous kumquat rolls aimlessly on the dashboard of Viggo Mortensen’s blue pick-up truck. The actor turns around for a few beats too long, and with an expression of affinity looks at the pretty mutt curled up on the messy back seat. It’s an attitude which has served the 39-year-old well since starring in Sean Penn’s directorial debut, The Indian Runner, back in 1991. Although Mortensen has never succumbed to the Hollywood charade, the roles he has chosen have at times veered towards the commercial, playing Demi Moore’s drill instructor in GI Jane or a bearded Lucifer in The Prophecy. Instead Mortensen regularly pursues opportunities in the finer arts as a writer (not this kind), photographer, and painter. The inveterate actor, whose self-taught, renaissance-man leanings have the reputation of being based on actual talent, has published two books of poetry, Ten Last Night and Recent Forgeries; released a spoken word CD titled One Less Thing to Worry About; and contributed to the New Yorker’s latest installment of their “Out Loud” series by reading from Jack Kerouac’s Journals. In addition to an arsenal of gallery exhibitions, Mortensen created his own artwork—muralistic abstractions combining painting and photography—for his role as the scam artist/painter in A Perfect Murder. The film, which co-starred Gwyneth Paltrow, was a remake of the 1954 classic Dial M for Murder. Though “For goodness sakes” may have been updated to “Damn it to hell,” getting knifed in the shower has a more timeless quality. Published December 1998 in Black Book. Notes: Photograph by Michael Tighe/Outline. 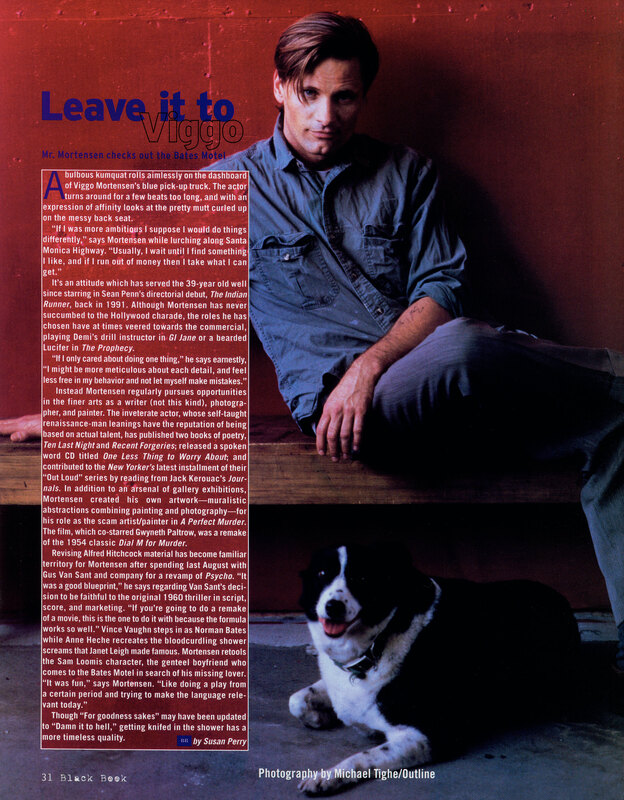 From the 1998/99 Winter issue of Black Book, copied from the House of Telcontar archives.